Adithis Amma Sews - Cute Confessions of a Sew Addict: 100 Followers - Giveaway - Saree Blouse E-Draft! 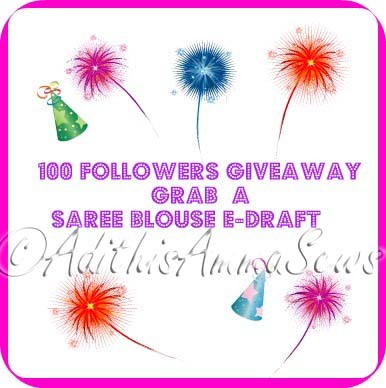 100 Followers - Giveaway - Saree Blouse E-Draft! I am writing this post to Thank you all for your Patronage & Encouragement given for my Sewing Expeditions here at Adithis Amma Sews. Thanks a ton! We have reached 100 follower milestone and its time to celebrate isn't it! How about a giveaway? This time i would like to do something i have never done before. Draft an e-pattern, this way i would learn something new, as well give away something useful and ready to use for people all over the globe. Yes! this giveaway is open to Readers all over the Globe, the winner will be receive the E-draft through e-mail ! Rules for entering the giveaway are pretty simple. Become a Follower - as this is a celebration of my followers. After becoming a follower, please leave a comment with your Size choice, only then i can add your entry to the draw. The Giveaway is open to All, till 14th February 2011. Hop in ! If you happen to like me on facebook or tweet about the Adithis Amma Sews. Leave a comment to let me know how you qualified your entry for the giveaway. So feel free to follow your heart! Thanks a ton! Join the Party! Participate in the Giveaway! Best of Luck! Hi Adithi's amma, I just became a member! Also follow you through my blog conenct as well. Would love to win this giveaway. size 34 please. Hey! I just started following you this week and I am enjoying your creativeness! :) I am not sure about the sizing but if it based similar to a bra, then a 36? Anyway, thanks for the giveaway! Hi! I love that you are taking up sewing! I'd like to learn myself one day! I'm a size 32! Hi, there! Nice to meet a blogger from India. Btw, do you want to gain more blog followers? Then come on and join my "Swap Followings" Linky Party. This is an excellent opportunity for every blogger to meet other bloggers, follow them, and be followed in return. How does this work? Just simply "swap your following" which goes like this, "I follow your blog so please follow mine." When you decide to join, click http://www.homemakeronadime.com/2011/01/swap-followings-linky-party-012411.html and this will lead you to our party. See you there! Hey girl, I would LOVE to get this pattern, especially since I need to make 2 blouses, for some new sarees, lol. I could always go get them done, BUT, doing it myself, sounds so much better. I need a sz 38 please, lol. I added this giveaway on my blog sidebar, in the giveaways sections!!! I posted this giveaway on my facebook page!!! I also tweeted about this giveaway!!! Hi please add me to your list of entries..I am a 36 :) Thank you so much for following me back, I love love your blog! I also clicked your Facebook link and added you as a friend, tomorrow is my birthday so it would be great to win the pattern, it would make my day for sure! Thanks again, The Stitching Chick! My website is about [url=http://www.depressionsymptomsmedication.com]Teenage depression[/url].